The muggers took the victim’s phone and wallet containing €110 in cash. 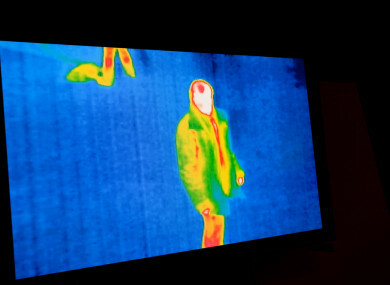 Stock photo of thermal imaging. A MUGGER WHO was caught hiding in bushes by gardai using thermal imaging from a helicopter has being ordered to do community service. During a robbery by Folarin Odunlami (22) and an accomplice, one of the muggers pulled a long steak knife and told the victim to empty his pockets. Dublin Circuit Criminal Court heard that the terrified victim feared he would be stabbed. As he was taking things out of his pockets, the second man got involved. The muggers took the victim’s phone and wallet containing €110 in cash and told him to run down the lane or they would cut and stab him. The victim ran into a nursing home and called gardaí. He then went in the patrol car and identified the two culprits at a nearby train station. Gardaí pursued the pair, who dropped 15 feet from a footbridge into a carpark and hid. They were detected a short time later, lying side by side under brambles, by members of the Garda Air Support Unit using thermal imaging. Odunlami of St Laurences Park, Drogheda Co Louth and formerly of New Haven Bay, Balbriggan, Co Dublin pleaded guilty to robbing a phone, a wallet and its contents from a young man on Station Road, Lusk, Co Dublin on March 9, 2016. At a hearing today, Judge Melanie Greally noted that Odunlami had expressed remorse and had not committed any offences since this robbery. She ordered that he complete 240 hours of community service. Sergeant Ciara Geraghty told Lisa Dempsey BL, prosecuting, that the victim had been walking home after visiting his girlfriend on the night in question. As he walked up Station Road in Lusk, he noticed two men on the opposite side of the road, one of whom crossed over towards him. This man pushed the victim back towards a laneway and pulled a long steak knife from his jacket. He told the victim to empty his pockets and said he wanted his phone, wallet and money, warning him, “if you don’t comply, I will cut you”. Gardaí found the victim’s phone and cash on the ground underneath where the men had been lying. All items were returned. A victim impact report was presented to court but was not read out. Odunlami’s two previous minor convictions are for theft and possession of knives. Patrick Jackson BL, defending, said the co-accused was a known robber while his client had not come to garda attention before or since this offence. He presented letters to the court from Dundalk IT, where Odunlami is studying computer systems, and from his pastor. The court heard Odunlami is from a strict Christian background and moved to Ireland from his native Nigeria when he was aged five. His counsel said he was bullied in school and had trouble with learning. He has worked in a barber shop and as a warehouse operative. Email “Community service for mugger caught hiding in bushes by gardaí using thermal imaging”. Feedback on “Community service for mugger caught hiding in bushes by gardaí using thermal imaging”.